It should be no surprise to those who’ve followed my quilling tutorials for a while that I love figuring how to make realistic quilled paper fruit and veggies. In a recent post, I even suggested using produce as inspiration when you’re feeling creatively stuck, because this is a trick I use all the time. So I couldn’t resist making a tutorial for one of my family’s favorite fruit. Get ready for some simple quilling paper cherries! 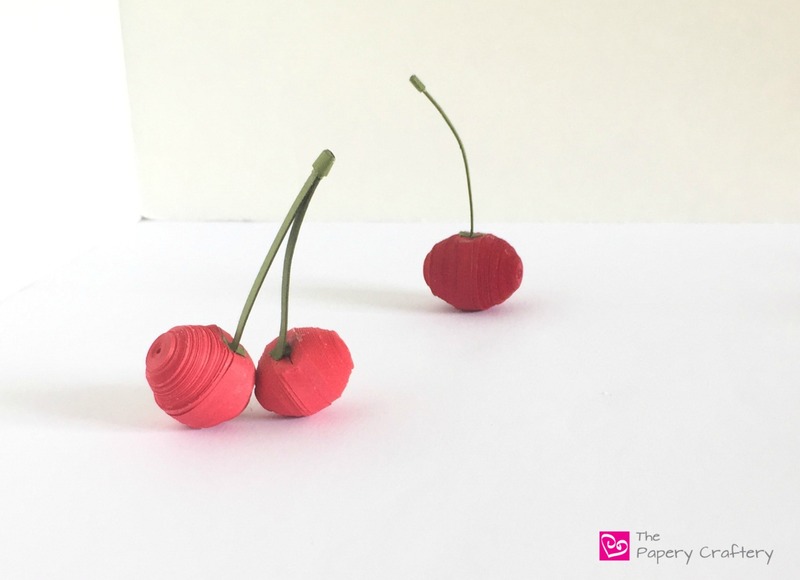 Quilling paper cherries are an ideal beginner craft for new quillers, especially those who are looking to try out some easy 3D quilling. I choose to use a dark crimson paper for my cherries, and my favorite leaf green for the stems. Plus, some glue and a needle or slotted tool. A quilling mold is helpful, but not necessary ~ you can always use your fingers or other rounded object to shape your cherries. But, I find using a mold makes everything a lot more even, and, I think, it’s actually faster. To start, make a tight coil from approximately 48 inches of red quilling paper. If you need to, glue a few strips together so it’s long enough. Roll another coil in the same way. Each cherry will use 2. Next, mold each coil so it makes a dome shape. If you’re thinking of getting a quilling mold, this is where it would come in handy. Simply place the coil on top of the rounded mold that corresponds to the size of your quilling paper coil. Gently spread your thumb and finger out from the center until the paper is pushed all around the dome of the mold. Again, you can use your finger or another rounded object to make your quilling more 3D, but for a few dollars, I think a mold is a great investment. Mold the second coil in the same way and try to make them as even as possible. Add some glue to the inside of your rounded coils so you don’t lose their shape. I like to do this with a needle-nosed bottle and a small brush. Cherries naturally have a little indent on the top where the stem is connected. So, of course, our quilling paper cherries will too! To do this, gently pinch the edge of each dome in two places, about a fingertip apart. After some trial and error, I found it was easiest to do this before the glue had dried completely. The end result will be two peaks with a dip in the middle. I kind of think it looks like a cat’s head! Run a small line of glue around the edge of one of your pinched domes and place the two halves together. Make sure the indented parts are lined up together. If you need to, clean up any extra glue with a small paintbrush. I also used a small strip of quilling paper to cover up the seam in the center of my cherries, but that’s totally optional. I wanted my stems to be really sturdy, so I folded an 8 inch strip of leaf green quilling paper in half and glued it together. Once dry, I folded that in half again and glued it together, leaving a tiny bit at the end unglued. The result is a 2 inch strip that has a very small bit open at the end. It’s almost like a very long letter “y”. Apply a very small amount of glue to the opening of the stem and place it on the dip in the top of the cherry. I like Tacky Glue for this. It’s a thick glue that helps bits stick right away, And it’s perfect when you’re impatiently holding a stem onto a cherry. Wrap a 2 inch strip of the same leaf green paper around the end of the stem to mimic the bump where the stem would meet a branch. Since cherries can come in a few different shades, I also quilled up some in a true red, and also a deep rose color. Try wrapping a couple cherries stems together, too! I have some big plans for these little guys! When I have a few more, I’m thinking of making a wreath from my quilling paper cherries. I’m also loving the idea of a bowl full of cherries on my dining room table for the summer! I hope you’re inspired to quill a few cherries this summer. As always, leave me a comment below and tell me what you think of these lovelies! I love quilling but I still haven’t had the courage to try it on my own. I admire your quilling skills big time!!! This is a great idea and it looks doable for a total quilling dummy like myself! I hope I can find the guts to give it a try, lol! Yay, Andrea! I’m glad you enjoyed the cherries! Go ahead and give them a try ~ quilling supplies are super inexpensive so you don’t have much to lose. I know you can make these! They are so dainty and pretty! I hope they do, Emily! Thanks so much! I learn something new about quilling all of the time. It’s very relaxing and therapeutic. Then you get to see something pretty that you yourself created. Thank you for sharing your knowledge. Thanks so much for stopping by, Vicki!